FILE - The Supreme Court building in Washington, D.C.
Shorthanded and ideologically divided, the U.S. Supreme Court has yet to take up any cases on politically sensitive social issues in its new term starting in October, instead showing a keen interest in more technical cases of importance to business such as disputes over intellectual property. In addition to four intellectual property cases it has already agreed to hear, the court could as soon as next week take up a trademark battle that pits an Asian-American rock band and the Washington Redskins football team against the U.S. Patent and Trademark Office. Later in the year, the court could take up a quirky copyright fight between a woman and a record company over a video she posted online of her toddler son dancing to a Prince song. The lineup so far is in contrast to the court's last term, in which it heard major cases on abortion, racial preferences and immigration in which it was closely divided. Those cases were taken up before the death of conservative Antonin Scalia in February, which left what is usually a nine-member court with a vacancy that shows no sign of being filled until next year because of the Republican-controlled Senate's refusal to consider President Barack Obama's nominee. FILE - A sign protesting a recent North Carolina law restricting transgender bathroom access adorns the bathroom stalls at the 21C Museum Hotel in Durham, North Carolina, May 3, 2016. Although the court has not taken up any cases of such social or political magnitude for the coming term, it's possible it could do so before it ends in June. The battle over whether transgender students can use bathrooms that match their gender identity is one candidate. It is not unusual for the court to take up a handful of intellectual property (IP) cases among the 70 or so it selects for oral argument, but this year there is a greater incentive than ever because they are often decided by unanimous or lopsided votes. Legal experts say the justices might seek to avoid cases on which they could split 4-4. Such splits occurred four times after Scalia's death and provide little legal clarity, as there's no written decision and no national precedent set. "I do think the court will be looking for cases that don't break along traditional partisan lines. IP cases fit that bill," said Mark Lemley, a professor at Stanford Law School. Such cases, on patent law, copyright and trademarks, can have high financial stakes, especially when companies fight over lucrative patent protections. One of the four IP cases already taken up involves a $400 million patent dispute between Samsung Electronics Co. Ltd. and Apple Inc. over the design of the iPhone, which will be heard October 11. In the court's last term, it heard three intellectual property cases, with two decided 8-0 and one 7-1, in line with the vote counts in similar cases in recent years. The trend in recent years, at least in patent cases, is for the court to frequently reverse appeals court rulings that are overly protective of patent rights. There is less of a pattern in trademark and copyright cases. Some lawyers think the court may have lowered its standards for the coming term, accepting cases that it can dispose of without 4-4 votes. The court can take cases for various reasons, such as to resolve splits between lower courts or to decide a question of pressing national importance. IP law experts cited one of the patent cases — a dispute over whether genetic-testing kits made by biotechnology company Life Technologies Corp., now part of Thermo Fisher Scientific Inc., infringed upon patents held by Promega Corp. — as an example in part because the issue is narrow and it has little chance of affecting other cases. Charles Duan, a lawyer with digital advocacy group Public Knowledge, was among those who questioned why the court took the Promega case, saying it "doesn't have much of a direct impact on the public." 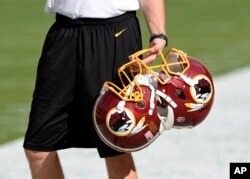 FILE - Washington Redskins football helmets are seen before a game in Landover, Md., Aug. 19, 2016. The Supreme Court could decide to hear a case this term centering on whether trademarks deemed offensive to some can be canceled. IP cases the court could still decide to hear this term include the two disputes over whether trademarks deemed offensive by some can be denied or canceled. The Slants, a rock band, whose members are Asian-American, chose the name specifically to reclaim a term used to disparage Asians. But the federal trademark office rejected the band's application for a trademark. In the other case, the Washington Redskins organization has long trademarked its name and objected when the trademark office sought to cancel it because it was deemed to disparage Native Americans. The court will also decide whether to hear the copyright dispute dubbed the "dancing baby" case over a video posted online that showed a toddler dancing to Prince's song "Let's Go Crazy." The legal question is whether copyright holders can face damages if they incorrectly tell someone to take down content posted online that is protected by the "fair use" doctrine, which allows unauthorized use of copyrighted material in some circumstances. The justices also have shown provisional interest in three other intellectual property-related cases by asking the Obama administration to file briefs offering its opinion on whether they should be taken up. One closely watched case on that list concerns Novartis AG's bid to launch a copycat version of Amgen Inc.'s cancer drug Neupogen. IP law experts say the court could take that case up because it is the first to reach the high court on a new law addressing so-called biosimilar drugs.